Many dividend stocks did well this year, but these missed the cut. Find out why. The Dividend Aristocrats list of top dividend stocks is a great starting point for investors seeking more income from their stock portfolios. However, just because a stock is a Dividend Aristocrat doesn't mean that it will produce good returns every single year. Even as the broader stock market made solid gains this year, several members of this elite group of dividend stocks lost ground. Three of the worst-performing Dividend Aristocrats were Cardinal Health (NYSE:CAH), Abbott Laboratories (NYSE:ABT), and VF Corp. (NYSE:VFC). Let's take a closer look at how these three stocks did and whether they can rebound in the coming year. CAH Total Return Price data by YCharts. Cardinal Health has a history of raising dividend payments that goes back for decades, and that has helped it gain a solid reputation in the healthcare industry as an income stock. The company currently pays a dividend yield of about 2.5%, and its most recent dividend increase earlier this year added about 16% to its quarterly payout, bringing it to $0.4489 per share. That growth rate has persisted for several years, leading its dividend to double since early 2012. Cardinal Health has had to overcome some tough conditions in the wholesale drug business. With many pharmaceutical companies under pressure to keep their prices lower, Cardinal hasn't been able to count on the price increases that traditionally help it keep its own margins stronger. Businesses in various other medical devices and accessories have given Cardinal some diversification, but given the uncertainty about potential healthcare reform in the wake of the presidential election, Cardinal investors are nervous. Elsewhere in the healthcare space, Abbott Labs has a long history of dividend increases. But for much of its 44-year history of consecutive annual dividend raises, Abbott had its pharmaceutical division helping to support its payout boosts. With the spinoff of its pharma division, the remaining Abbott is focused on medical products. Its 2.7% yield is still healthy, although its most recent dividend increase only added $0.005 to its quarterly payment of $0.265 per share. Abbott Labs has seen ups and downs this year. In September, the company sold off its Abbott Medical Optics business to Johnson & Johnson for $4.33 billion, helping Abbott move more strongly into specialized devices. Yet planned acquisitions of St. Jude Medical and Alere could result in massive changes to Abbott Labs' business, and controversy concerning Alere's accounting issues has led Abbott to try to terminate the merger deal. Combine that with the uncertainty in healthcare more generally, and it's easy to understand why the stock hasn't kept up with its better-performing Dividend Aristocrat peers in 2016. Finally, VF Corp. has seen modest declines as well. The apparel company behind brands like The North Face, Vans, and Timberland has fallen 8% so far in 2016. Yet for 44 straight years, VF has boosted its dividend, and its most recent increase of 14% took the quarterly payout to $0.42 per share, making for a yield of 3.1%. The environment for retail generally in 2016 has been tough, and VF hasn't been immune to the adverse trends that have worked against the company and many of its peers. Sales growth has been tepid, and inventory management challenges have weighed on earnings. Yet the company has made some smart moves to redirect its business into its most lucrative prospects going forward. Moreover, the athletic apparel space has been doing better than some other retail sub-segments, and that could help push VF higher even if the rest of the industry doesn't necessarily follow suit. Its results will rely heavily on the current holiday season, but VF has better prospects than many give it credit for. 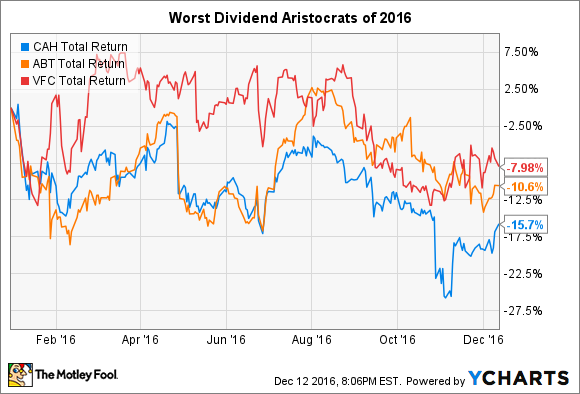 Not every Dividend Aristocrat has done well in 2016, and investors need to remember that even great stocks can have bad years. Once some of the adverse trends that have held these three stocks back start to wane, their history of solid returns should reassert itself.